Chukar Hunting with Wing Works vest. Here is the short and sweet. This vest is the best one I've seen, bar none, for long casts in the field. It puts the weight on the hips (and shoulders), has lots of room for shells, sweaters, cameras, Astro's, transmitters, licenses, etc. A back pouch for a sandwich, two huge water bottles, a camera pouch fitted to the one of the straps, orange reflective straps and orange on the back give this vest tremendous capability. 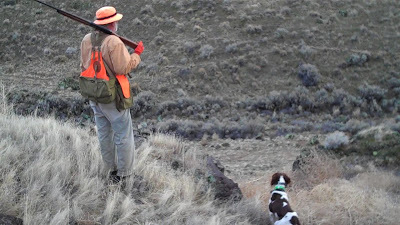 Shown above is my dog, Cap, and me on a Chukar hunt in Idaho last February. Note that I've taken my jacket off and tied it to a convenient strap (just for that purpose). You can see the chest connector strap in the picture, too, which keeps the shoulder straps in place. It is apparent to me a lot of thought through a lot of miles on the ground has gone into this vest. My initial evaluation: http://www.abirdhuntersthoughts.com/2011/02/hunting-vest-initial-evaluation-of.html. If you are going to be jumping in and out of the hunting-mobile all day, a simple strap vest may be more appropriate. It takes more than 2-3 seconds while hoofing it after the dog to get this vest on and tight. In fact, I carry my old Filson strap vest in my truck vault just for those days. Here you can see the reflective shoulder straps! The only down side to this vest is actually a plus. It is sturdy, strong and takes a beating; and, therefore, it is not light. To my mind, I would rather carry a few more ounces and have the strength. In my opinion, this is a must buy for the serious bird hunter.